The Port of Tampa was closed for ethanol cleanup due to a train derailment. On June 25th, 2013 hazmat crews responded to a train that derailed at the Port of Tampa in the morning hours. It was estimated that 4,500 gallons of ethanol spilled from the overturned train and cars that were involved in the derailment. Officials stated that 14 plus cars were involved in the crash with 11 cars on their sides. At the time of the incident it was raining and lightening which dampened cleanup efforts that include the use of foam. When ethanol is shipped by rail, it is commonly more flammable than gasoline. Experts have uncovered that ethanol breaks down in the environment, in a few weeks of the spill, so soil and groundwater may be limited to contamination. Police state that nobody was injured and the investigation is still ongoing. 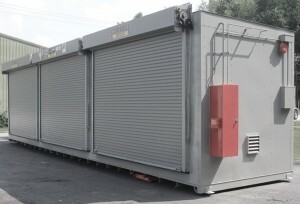 Chemical storage units provide a safe and compliant method of storing your flammable liquid storage. With fully enclosed walls and our leak-proof secondary sump containment you can be assured that your flammable liquid storage will be fully compliant and maintained. With our leak-proof secondary sump containment, your flammable liquid storage will remain contained, in the event of a leak or spill. Our chemical storage units are built from heavy-duty, 12-gauge steel for maximum strength and durability to keep your flammable liquid storage maintained and safe. Our chemical resistant epoxy coating gives your flammable liquid storage the safety and security needed for safe and proper storage. Chemical storage units from U.S. Chemical Storage provide the safest and most secure flammable liquid storage.